And somehow, the beauty reminded me of how important it is to me that the Gods are persons. I’ve been reading Plotinus, a neoplatonist philosopher, and he’s fascinating. His Enneads are one of the foundational texts of western mysticism and magick…but he’s missing something. It’s the same thing I found missing in the Tao Te Ching. Taoists and neoplatonists both strive to be passionless. Plotinus would have us disregard our bodies, the better to ascend to the level of the Gods. His theology is all about understanding, not about loving. That doesn’t make his mysticism worthless, just incomplete. A friend at Quaker meeting was talking to me recently about a plot of land that she and her husband were thinking of turning into a green burial ground, and she told me about an idea she’d heard of for a burial shroud infused with mushroom spores. 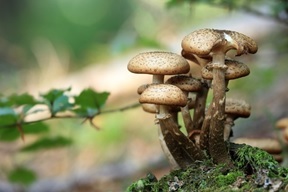 The mushrooms that grow on your grave consume your body, helping it to decompose and removing toxins that might otherwise leach into the environment. And I thought, yes! What better, more intimate way of connecting at the end of life to the deep magick of the Earth? Plotinus would be horrified, not by the mushrooms, but by my wanting to celebrate the way the matter of my body joins me to the Earth. For him, the soul is degraded by its entanglement with a material body, and our purpose in live is to ascend to the realm of divine intellect. I say no. Life in a body is what makes us whole. It’s what allows us to love, not just one another but also the Gods. particles, both matter and antimatter. and those that cast apart. Each to rule in its own way. as day turns to night and night to day. and filled it with knowing.